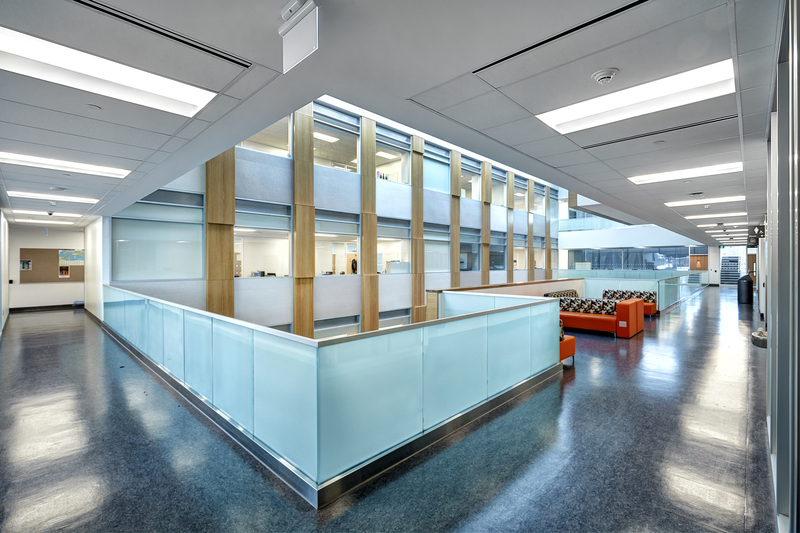 University of Toronto Scarborough Campus' (UTSC's) new $52.5 million Environmental Science & Chemistry Building (ESCB) welcomed its first students in autumn of 2015. Contributing to the building's multiple goals, ROCKFON® acoustic stone wool ceiling panels and suspension systems support the University's architectural vision, functional performance requirements and sustainability criteria, while completing the project within budget and on schedule. Located on the north campus, ESCB's science and education research hub offers masters and doctoral programs addressing environmental issues. With respect to the promise of its discipline, the building is designed and built to achieve LEED® Gold certification through the Canadian Green Building Council. Once certified, it will be the second building at the University of Toronto Scarborough to attain this international rating. "It was a mission of mine to achieve the highest possible level of efficiency for this type of energy-use intensive building prior to the design team and contractor coming on board," said UTSC Facilities Management Department's project manager, Hovan Stepanian, M.Sc. "Initially, we targeted Silver; however, working with the design team, we were able to fine-tune the various sustainability initiatives to target Gold." ESCB's design-build team included Diamond Schmitt Architects with EllisDon Corporation. Inspired by nature, the 126,788-square-foot new building reflects the academic pursuits housed within the facility, as well as its setting on the edge of a ravine. 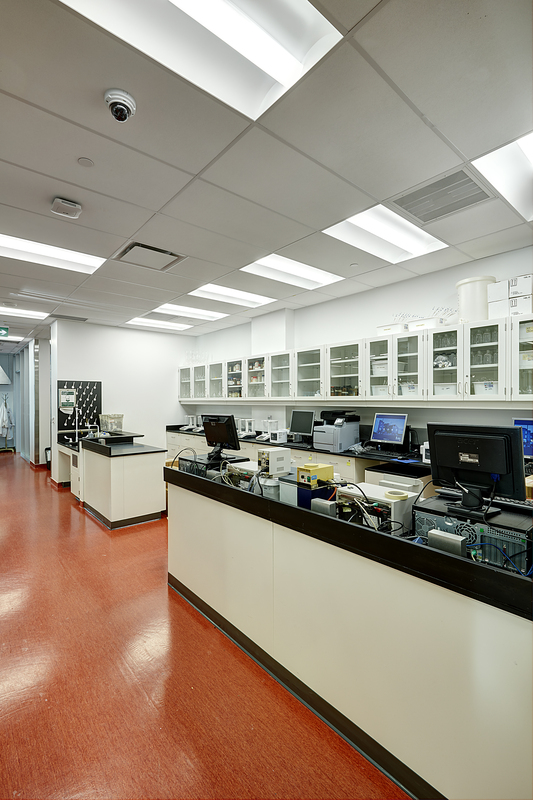 The five floors of laboratory space rely on a modular approach for flexible adaptation to future academic and technological needs. Through ESCB's two years of phased construction, Nelmar Drywall Company Ltd. depended upon Patene Building Supplies to supply ROCKFON ceiling systems. In selecting ROCKFON products, Diamond Schmitt's associate, Nigel Tai, M.Arch., OAA, MRAIC, LEED AP, noted that he found these ceiling systems to be "cost-effective and aesthetically pleasing with good performance." Conceived as a highly flexible research and teaching space, ESCB connects laboratories and academic offices around a five-story, sky-lit atrium. 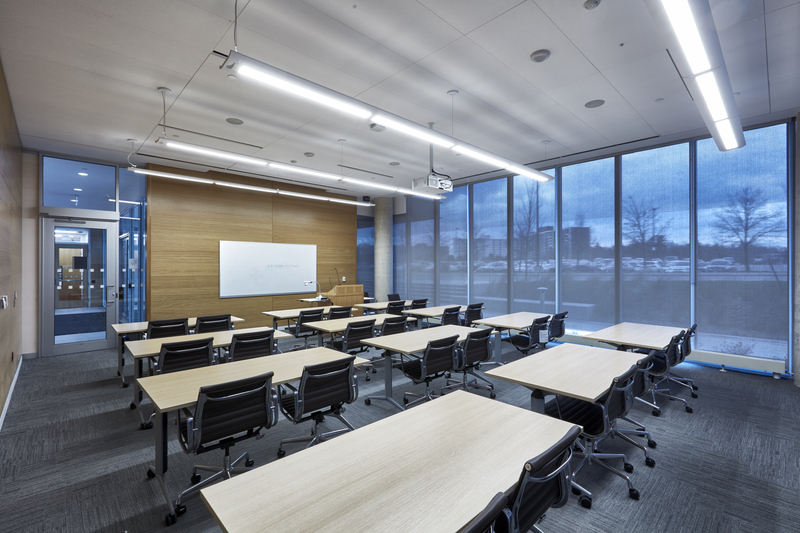 ROCKFON Alaska® acoustic stone wool panels in special sizes with shiplap edge details were installed in Chicago Metallic® 1200 Series exposed 15/16-inch ceiling suspension system. In total, Nelmar Drywall installed 2,045 square feet of ROCKFON ceiling systems. An additional 18,837 square feet of ROCKFON Artic® ceiling panels were installed through the corridors, as well as in faculty offices. "We wanted a sharp, clean look for the ceiling surface. The hairline shiplap joint detail was important to us, as well as the custom 2-by-5-foot proportion," said Tai. "Smooth finishes and good light reflectance were critical. We use the ceiling finishes as a reflective surface to bounce light around in the meeting rooms and boardrooms." Scott Debanham, district sales manager with the ROCKFON Group, understood the essential mix of aesthetics and performance for the project. "We had a perfect solution. The smooth white surface of our Alaska acoustic stone wool ceiling panels reflects up to 86 percent of available light, dispersing natural light more effectively. The better distribution of light means offices can lower their light loads and reduce cooling costs, helping meet LEED's energy-efficiency criteria," he explained. ROCKFON stone wool ceiling panels in North America also are UL/ULC certified for Flame Spread and Smoke Development. In addition to these attributes and the high light reflectance, Tai sought a minimum Noise Reduction Coefficient (NRC) of 0.70. Exceeding expectations, most stone wool ceiling panels have an NRC of 0.85 or higher and ROCKFON Alaska has an NRC of 0.90 as standard. Due to its inherently open porous structure, stone wool is a high-performing, sound-absorptive material. "NRC is important in areas where people converse in groups and high levels of noise are present. High sound absorption helps control the ambient noise levels and prevents excessive reverberance. This increases speech intelligibility, improves concentration and mitigates the 'Lombard effect,' where people talk louder and louder to make themselves heard when trying to talk in noisy environments," advised Debanham. Considered in the context of academic performance and occupant health, acoustic comfort also can be a factor in LEED certification. Recycled content is a more obvious consideration with LEED and sustainable design. ROCKFON stone wool ceiling products are made from basalt rock and contain up to 42 percent recycled material. "Another natural advantage of water-repellent stone wool is that it not only repels harmful microorganisms, mold and bacteria, but it also meets stringent requirements for restricting volatile organic compounds (VOCs)," commented Isabelle Champagne, architectural sales manager with the ROCKFON Group. Helping improve indoor air quality, the extensive portfolio of ROCKFON acoustic stone wool ceiling solutions has earned UL® Environment's GREENGUARD Gold Certification for low-emitting products. Due to their low particle emission, ROCKFON Medical products meet stringent requirements for air cleanliness in healthcare and clean room environments. 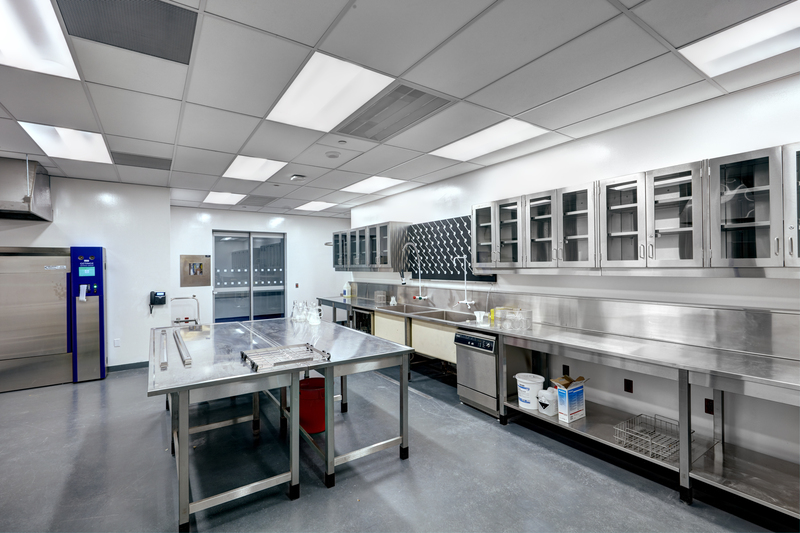 In ESCB's laboratories, Chicago Metallic 1200 Series exposed 15/16-inch suspension systems support approximately 14,154 square feet of ROCKFON Medical Plus™ and Artic square lay-in ceiling panels. ROCKFON Medical Plus has Bacteriological Class B1 and Clean Room Classification ISO Class 4. All ROCKFON Medical ceiling panels also are Methicillin Resistant Staphylococcus Aureus (MRSA) resistant. "ROCKFON Medical ceiling panels not only help stop the spread of infection, but select product finishes are also designed to withstand rigorous cleaning," said Champagne. "All of our ceiling systems at the ESCB are durable and require only minimal maintenance. When maintenance is needed, it's easy to remove one or several ceiling panels to gain access to the plenum and to return them without damage." 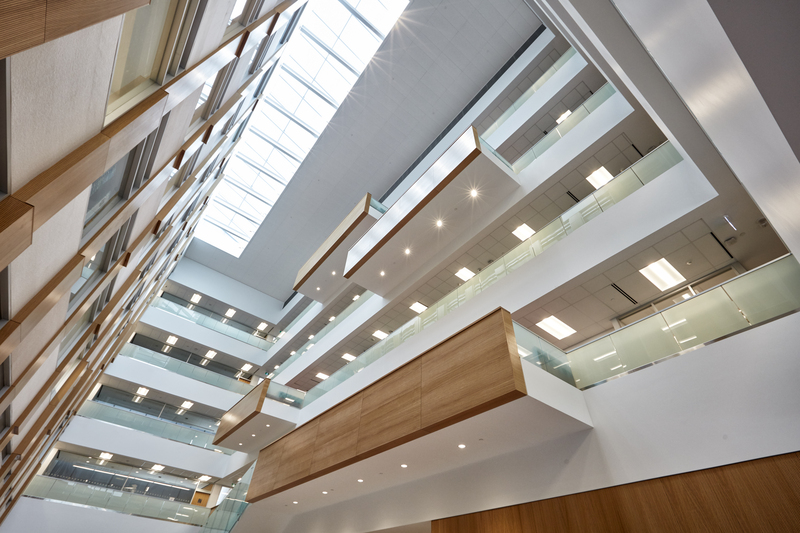 UTSC's Stepanian agreed that having a ceiling that was easy to remove and replace was one the most important aspects in selecting ROCKFON ceiling systems. He reiterated the value of acoustic performance, light reflectance, as well as being durable, cost effective and aesthetically pleasing. He added, "ROCKFON was a new product to us and, so far, we are very pleased with the performance and durability." Along with meeting the performance specifications, Tai concluded, "given that ROCKFON is priced very competitively," he expects to see more architects specifying ROCKFON ceiling systems. The ROCKFON Group is a leading provider of acoustic stone wool and metallic ceiling solutions and suspension systems. With the acquisition of Chicago MetallicCorporation Inc., the ROCKFON Group provides customers a complete ceiling system offering combining stone wool and specialty metal ceiling panels with Chicago Metallic suspension systems. The ROCKFON Group complete ceiling systems are a fast and simple way to create beautiful, comfortable spaces. Easy to install and durable, they protect people from noise and the spread of fire, while making a constructive contribution toward a sustainable future. The ROCKFON Group is a subsidiary of Denmark-based ROCKWOOL International A/S, the world's largest producer of stone wool products. ROCKWOOL International A/S is listed on the NASDAQ OMX Nordic Exchange Copenhagen. More than 11.000 people in 35 countries are employed within the ROCKWOOL Group. For more information, visit http://www.rockfon.com.